Thank you for visiting the website of 1 Stop Promotions. 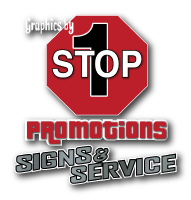 Locally owned and operated by Tina and Stephen Way, 1 Stop Promotions has more than 20 years’ experience in the promotional industry. Whether you’re a sports team seeking new uniforms or an employer desiring to outfit your staff with fashionable jackets shirts or headwear, 1 Stop Promotions is your solution. We also provide embroidery, screen printing, vehicle graphics, signs and decals, banners, full colour imaging and promotional products. If you have any questions about our services or would like to place an order, please fill out our handy eform below and we will get back to you as soon as possible!